ENTER A PLACE BORN FROM ALL OF LOVECRAFT'S CREATIONS, AND GOVERNED BY SERVITORS OF THE OLD ONES. GREAT ARKHAM - THE CTHULHU CITY. There is - by certain unreliable and maddening accounts, and now by your own dreadful experience - a city on the eastern seaboard of the United States, north of Boston in Massachusetts. You do not recall seeing it on maps when you were growing up, and no-one of your acquaintance ever admitted coming from that place, until you found yourself living within the eerie confines of Great Arkham. It is a city of windowless cyclopean skyscrapers, of crumbling baroque buildings, and ruins that, impossibly, pre-date human habitation in this part of the world; it is also a city of roaring industry and crowed streets, beset by organised crime and political corruption. At times, you can see remnants of familiar small towns which have grown together into this monstrous conurbation - Dunwich in the west, beyond Sentinel Hill; quaint Kingsport, by the sea, industrial Innsmouth, the engine of trade and commerce; and the city's heart, Old Arkham. The vertiginous terror of inverted order! ; Worshippers of the Great Old Ones rule from City Hall, while Investigators are wanted criminals! After the infamous Miskatonic Raid which put an end to the "anarchist plots" of the Armitage Inquiry, who dares challenge the authorities? Intrigue and action in the twisted streets! In a campaign of urban horror, evade the watchful eyes of the authorities with the new Suspicion rules! Smash the cults - or conspire to pit one faction against the others! Includes The Whisperer in the Light, a full-length noir-flavoured adventure set in Great Arkham that takes Investigators on a tour of the mysterious city.... and into the beyond! 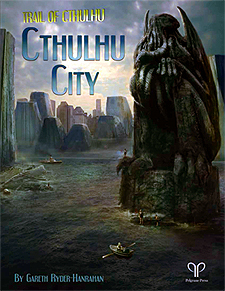 CTHULHU CITY - AN INESCAPABLE NEW SETTING FOR THE TRAIL OF CTHULHU RPG.